I don't often travel to see things. Sure, things - buildings, temples, skylines - can be quite eye-catching, but they often give you little appreciation for a place without an understanding of their context. People are much more interesting to me. People explain things. People are vibrant and dynamic and exciting. People define the culture out of which things arise. Yet there are some destinations - some things - in the world that, regardless of the height of your expectations, still live up to (or surpass) the hype. (I've heard that the Taj Mahal in India and Angkor Wat in Cambodia are two such places.) For me, even three visits wasn't enough to satiate my appetite for Shwedagon Paya in Yangon, Burma. Burma is one of the most overwhelmingly (about 90%) Buddhist countries in the world. 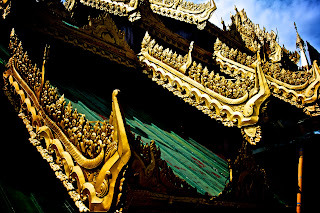 And for the Burmese Buddhist there is no more important pilgrimmage site (domestically, anyway) than Shwedagon Paya ("paya" meaning, roughly, "pagoda" in Burmese). Sitting like a giant golden Hershey kiss on the highest point in Yangon, Shwedagon looks over everything, and everything looks up to Shwedagon. It greets the first rays of sunlight in the early morning and puts the sun to sleep at night. Even at night it remains illuminated by floodlamp, when it shimmers in stark brilliant contrast to the inky Burmese night sky. It outshines the moon. To be fair, the dome is probably worth more than the actual moon itself - especially if the legend of its entombed relics is anywhere close to factual. Supposedly, soon after Gautama the Buddha first achieved enlightenment 2500 years ago under the bodhi tree in northern India, two Burmese merchant brothers encountered him with gifts of sweet cake. In thanks (or perhaps trade), the Buddha gave the brothers eight hairs from his own head (I wonder how many hairs they collected on their journey before they found an actual buddha). The brothers brought the future relics back to Burma and presented them to the king, who promptly enshrined them on the highest hill in the city now known as Yangon. 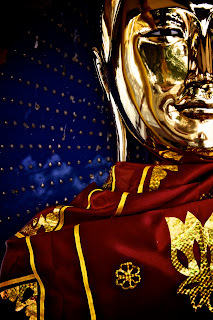 Enshrined along with it were a staff, water filter, and part of a tunic from three previous buddhas. The king erected a giant stupa erected above them in their honor. 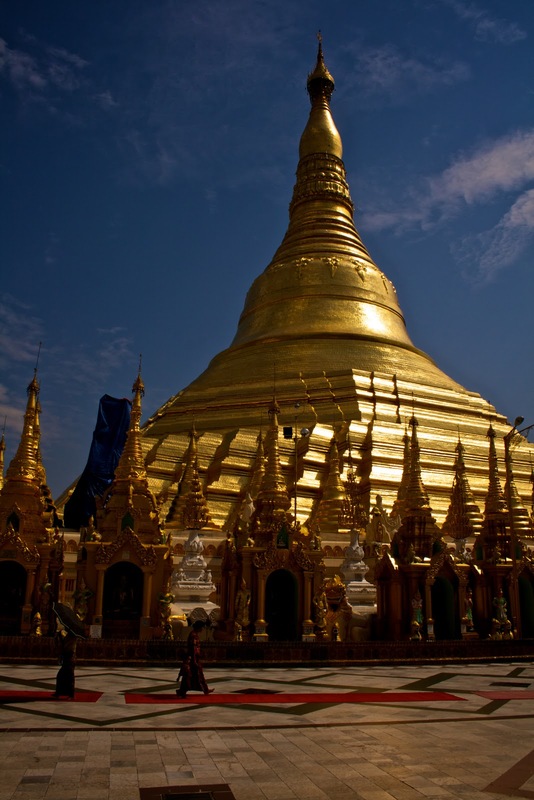 To pay tribute to the relics contained beneath her, the Burmese have clothed Shwedagon in a golden bejeweled dress that would likely give the country's central bank a run for its, well, money. By day the soft translucent marble of the pagoda platform cools the bare feet of pilgrims and tourists that flock here. Under the cool evening sky it glows like warming coals under the reflection of the giant golden dome above. In accordance with Myanmar astrology, 8 planetary posts surround the pagoda - one for each day of the week and two for Wednesday - AM and PM. Pilgrims locate the post for their own birth day to pray for blessings as they pour water over the buddha image and animals that represent their day. The pagoda is best seen at sunrise and sunset, though plan to spend a few hours - at least - strolling around the platform or just sitting in silence and soaking it all in. Monks often enjoy approaching foreigners to practice their English. To visit: Everyone must take off their shoes, and foreigners must pay 5 USD (per entrance, not per day). It's totally worth it. Like I said, I visited three times. And that doesn't count the times I went just to hang around outside.